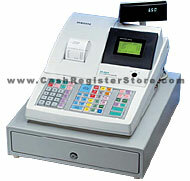 Samsung ER-650R Electronic Cash Registers at Cash Register Store. The Samsung ER-650R ("R" Meaning Raised Keys) is truely a fully equiped electronic cash register. Higher end, more expensive Samsung cash registers have VERY LITTLE over this system. The ER-650R cash registers come standard with a full size cash drawer, multi-line LCD operator display for easy training, programming and general use, extremely reliable thermal printer, and 2 RS232 ports. Each RS-232C port can be connected to any of the following: PC, scanner, scale, remote printer, remote pole display, coin changer or a security system. Using IRC (inter register communications), up to 8 registers can be connected for consolidating store wide reports and/or programming. Optional communications software can be used to upload or download cash register sales data directly from a PC, or via a phone modem. Daily transaction details, as well as sales and financial reports can be uploaded to your PC for storage and/or further review. Quiet, 9.3 lines per sec.